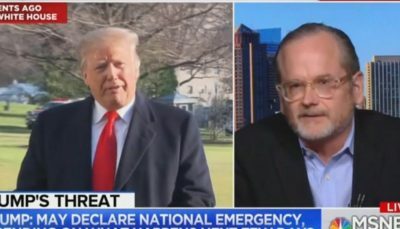 Lessig’s comments came on the heels of Trump saying that he “may declare a national emergency” if Congress does not act to appropriate enough money for his proposed wall along the U.S.-Mexico border. Some congressional Democrats raised legality questions after Trump made the comment. Lessig was not pleased by the statement, either. “So what type of powers would he have if he were to declare a state of emergency?” the MSNBC anchor then asked. “I think ultimately he has no constitutional authority to exercise the power to build this wall without Congress’ approval, and these statutes were certainly not written with the intent to give a man like Donald Trump the power that he’s now claiming but it’s not an efficient process to check him and that’s the uncertainty I think Congress now has to face,” he said. Jon Street is a news editor for Campus Reform. Six years ago, Jon cut his reporting teeth fresh out of college as an intern at Media Research Center’s CNSNews.com, where he interviewed multiple members of Congress and former presidential candidates. From there, he went on to complete a stint at Watchdog.org, where his exclusive, investigative work was picked up or cited by the New York Times, Washington Post, Fox News, National Review, and the Drudge Report, among others.